The Armenian region was known during the Iron Age as Urartu, and in the 9th century BC the Kingdom of Van was established to defend the highlands from Assyria. 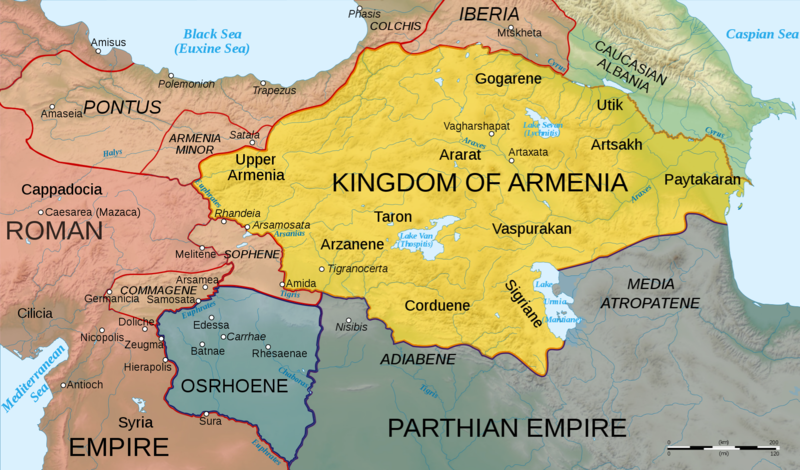 The kingdom ultimately collapsed in the 6th century BC at the hands of invading Medes, and a realm called "Armenia" emerged from the territory of the fallen kingdom shortly after. In 553 BC it was incorporated in the Persian Empire as a satrapy but in 321 BC Armenia again became an independent kingdom. After the division of the Roman Empire into Western and Eastern empires, and the rise of the Sassanian dynasty in Iran, Armenia would be on the frontier of the Roman–Sasanian wars. This would ultimately lead to the partitioning of Armenia into Byzantine Armenia in 387 and Sassanian Armenia in 428, which would bring an end to the history of ancient Armenia, and begin the period of Medieval Armenia.